Hospedaje Casa del Inka i Cusco, Peru: Reservér nu! 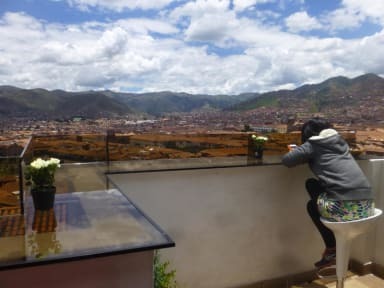 Hospedaje Casa del Inka is a friendly property located in Cusco, run by a family dedicated to tourism. Our mission is that each of our guests are totally happy and comfortable as in their own home is so we work daily in this mission with personalized attention and a friendly and familiar service where we share experiences, and we exchange cultures. Hostal Casa Del Inka offers free Wi-Fi and breakfast. A fully equipped common kitchen is featured. Hospedaje Casa del Inka in the north side of the historic center. The property is well-located close to many tourist attractions (museums), restaurants and shopping center. Hostal Casa Del Inka is 7 km from Velazco Astete Airport. The property offers private rooms with private bathroom and dorms with shared bathroom. Hot water is available 24/7.